Do you sleep best with some background sound from music or radio or TV, but don't want to disturb your bedmate? You can try wearing headphones -- until the first time you roll over on your side. And it's not a good idea to spend all night with earphones / earbuds inserted in your ears. Instead, try out the AcousticSheep SleepPhones -- a Polartec fleece headband with integrated speakers so you can wear them comfortably all night ("like pajamas for your ears"). The SleepPhones are adjustable, since you can slide the roughly 1 inch speakers within the headband. They're available in three sizes and a variety of calming tones (lavender, gray, black). You even can remove the speakers (though a Velcro seam) for washing. Other uses include muffling snoring with music or even white noise, setting a personal alarm clock (timed alarm track with programmable music players), or exercise headphones (since they absorb sweat and are washable). SleepPhones were created in 2007 by Dr. Wei-Shin Lai, a family doctor now at Penn State, who was interested in using binaural beats (see free downloads and references) to help get back to sleep when on call and woken in the middle of the night. Along with the SleepPhones headband for $49.95 and $54.95, AcousticSheep offers bundles with music, nature sound, and hypnosis CDs for $64.95 and $69.95 (see free track downloads), plus other sleep-inducing materials including lavender soap and sachets with relaxing aromatherapy scent. The CDs have acoustic binaural beats to induce relaxation and drowsiness (progressively slow over 30 minutes). It's the acoustic equivalent of counting sheep. The Quirky Cordies cable organizer is a simple and clever idea -- a spiral made from weighted but flexible rubber that can sit on your desktop to keep all those loose cables organized, including power cords, USB cables, cell phone chargers, audio cables, and headphone cords. Just slot your loose cable through one of the loops so you can bring some order to the chaos of all your electronic devices. And the backstory on the Cordies is even more fun. We've all had flashes of inspiration for little gadgets to solve nagging problems, but there's no practical path to try to turn them into real products. Quirky is a social network site for crowd-sourced products. The community rates ideas and then helps develop them, so Quirky can bring them to market. The kicker is that the contributors to each product share in a royalty stream from the sales, based on their contribution -- from the original idea to the industrial design, product research, product name, tagline, and logo design (see earlier post). The Cordies are now in full production, and are available for $12.99 in a variety of bright colors. The loops actually snap apart, so you can assemble your own custom sizes from multiple units. Digital bits seem so pure and clean, but our electronic devices can get seriously icky from our sticky fingers -- Have you really looked at your PC keyboard or mobile phone keypad lately? Enter Cyber Clean -- a sticky lime-green ball of goop that picks up all that crud that's encrusting your devices. It cleans on contact, squeezing into crevices to pick up dirt and dust, but doesn't leave a residue on your fingers, or migrate to other surfaces. 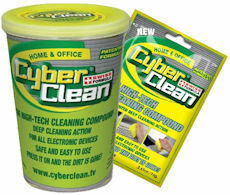 Cyber Clean is described as a Swiss formula that's non-toxic and biodegradable. It's available in home & office and automotive versions, in resealable foil zip bags for around $6, and in larger cups for $8 to $10, so you can deal with other nasty surfaces like telephones, appliances, remote controls, watches and jewelry. Find the Cyber Clean Zip Bag and Home & Office Cup on Amazon.com. The difference is clear with the new Verizon Wireless Droid X from Motorola -- it's got a big, big display. For some, this is a great blessing, to view your apps and websites and messages more clearly, and to better enjoy and share photos and videos. But for others, the result is a handheld device that can stretch the limits of what fits comfortably in your pocket or purse. The larger display not only means bigger icons and text, but also more information on the screen. The size also helps when you play widescreen video, especially if other people are trying to watch at the same time. Not surprisingly, the bigger screen on the Droid X results in a bulked-up case -- 5 x 2.6 x 0.4 inches, compared to 4.6 x 2.3 x 0.47 for the Droid Incredible. (Yes, the Droid X actually is thinner, with a slimmer profile that swells out at the top for the camera. The Droid X also is almost an ounce heavier at 5.5 vs. 4.6 ounces. The result pushes the bounds of today's understanding of "handheld." If you lay the Incredible on top of the Droid X, both the bottom buttons and side frame are still visible. But this is the whole point of the Google Android platform. While Apple designs the iPhone in only one current model, for which it selects the features that you may have, the Android platform is open for different manufacturers and wireless carriers to sell different configurations, so you can find the model that best fits your needs. Just from Verizon Wireless, your Android options are the original Motorola Droid with slide-out keyboard (see earlier post and article), the HTC Incredible with a faster processor, higher-res 8 MP camera, and optical joystick (see earlier post and article), and now the Droid X with the bigger display. Plus, the various Droid models offer features including FM radio, expansion memory (up to 32 GB with micro SD cards), and wireless mobile hotspot (to share the 3G cellular connection as a Wi-Fi hotspot). As a multimedia device, the Droid X steps up to 720p HD video capture with the 8 MP camera, and offers HD playback on your HDTV display with the built-in micro HDMI connector. It also supports wireless sharing of music, photos, and videos to devices on your home network with DLNA technology. However, the flip side of the open Android approach, versus a strictly controlled platform, is the potential for anarchy in different versions of different software on different devices with different features. Yes, the smartphone has reached a crucial mass of capability and corresponding complexity, so the open PC vs. more closed Mac platform debate will play out again in handheld devices. We've seen these issues before. Another issue, though, is the desire of manufacturers like Motorola and HTC to differentiate their Android products by enhancing and improving the Google software with customized interfaces and changes to various applications. 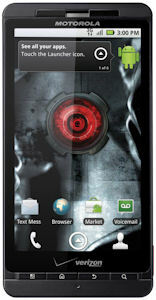 For example, the Droid X home screen has permanent soft keys for Phone and Contacts and Apps, plus a pop-up strip to help you navigate the seven home screen panels that you can customize with shortcuts and widgets. The panels come preloaded with scads of widgets, some taking up a quarter or half the screen, for news and tips and photos and contacts and app launcher and music playback and weather and email and airplane modes and calendar and social networking. Whew! That's too much even for a computer screen, so it really seems out of place on a smartphone. The bottom line, however, is that you have options. The Android platform is evolving rapidly, with the latest Google Android 2.2 release (see earlier post) is due out on the Droid X later this summer, with Adobe Flash Player 10.1. You may choose the Droid X with the big display for enjoying and sharing media, or prefer the original Droid for lots of messaging on the slide-out keyboard, or select the Droid Incredible for a compact and powerful Android experience. 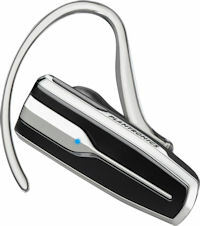 Plantronics has a strong line of Bluetooth headsets, each designed with a clear focus on a particular the type of user. For example, the Plantronics Voyager PRO is an over-ear design designed for comfortable long-term wear, for on the road or around the office (list $99, street $69, see earlier post). In comparison, the Plantronics Discovery 975 is a minimalist but even elegant design for occasional use, with a squared base and thin boom mic, plus a protective carrying case that is also a charger to triple the talk time (list $129, street $81, see earlier post). Then the recent Plantronics Explorer 395 is designed for first-time and casual users. It has simple controls, with a clean design with black and silver accents, plus Plantronics DSP technology for echo cancellation and to reduce wind noise. To simplify operation, the Explorer 395 has separate buttons for Power on/off (slider along one edge), and Volume level (on the other edge), plus Call answer/end control (on the face), and a clear red/blue LED status light. For extended use, it provides up to five hours of talk time, and seven days on stand by. 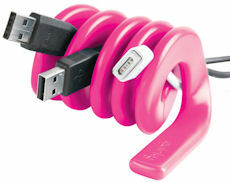 It charges easily with a standard microUSB connector, with full charge in two hours. And for comfort, the Explorer 395 includes a contoured ear tip and swivel earloop for over the ear (but not multiple shapes, materials, and sizes), so you don't have to root it in your ear canal or worry about it falling off while you're on the go. The result is a nice and straightforward headset that also small and light. It's inexpensive (list $49, street $30), and a good choice for new or occasional users. See my Audio Accessories Gallery for details and related products. Entries posted to Manifest Tech Blog in July 2010, listed from oldest to newest.